A lot has happened in the last few weeks, this past month especially has been a world wind of emotions. A lot of feeling like life back over there in the states is moving forward and feeling a little helpless in that I can’t take part in it. November is kind of the start of the Holiday season, and here it doesn’t really feel like it. But I know that everyone else in the states is starting to prepare themselves for the holidays. Here we decided to try to celebrate the best way we could by having a Thanksgiving dinner. We separated into groups and selected a “traditional” American Thanksgiving dish to prepare. I got corn bread! 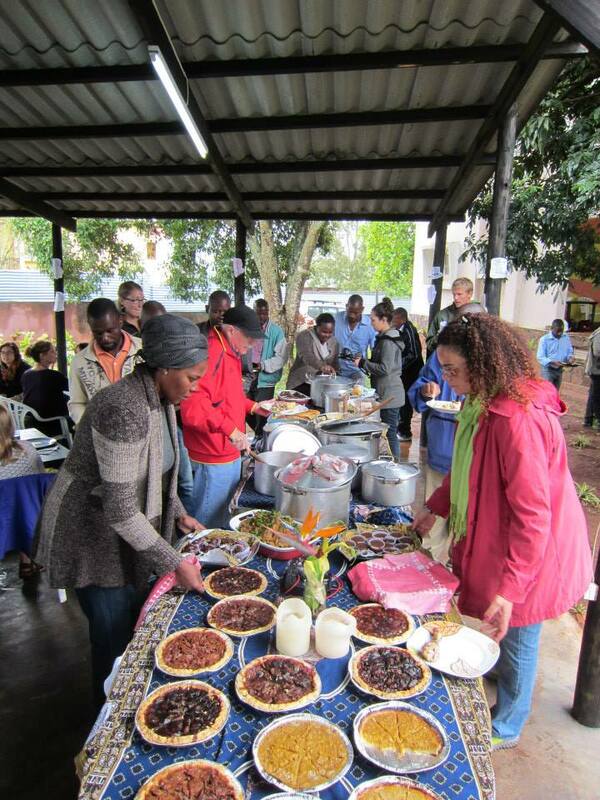 Each group prepared cooked a dish with the resources that we had, and we ate! Mashed Potatoes, Turkey, Green Bean Casserole, Cornbread, Sweet Potatoes, Stuffing, Pecan Pie, Apple Pie. I was highly impressed with the ability of our group to whip up some amazing food! And I was as stuffed as I would have been if I was as at Thanksgiving dinner at my house. Next this was the last month for our time with our Homestay Families in Namaacha, our original town. Beginning the month of November we knew that very soon our group would be separated from each other and sent to work in different areas of the country. We were all nervous on the day of the big reveal. We received envelopes with a letter inside, and we were to open them at the same time, read the letter and then move to our new site on a giant map they had drawn. Some people had already started crying at the thought of moving so far away from the people that they had gotten so close to during our training. I was nervous but excited. The idea of moving away from the others wasn’t as much on my mind as the idea of moving into the unknown. As I opened up my letter and I read I was excited to find out that I was moving to Manhica, the same town that I site visited! Not my first choice of where I wanted to go for site, but I was excited either way. I’ll get into more about Manhica later in this letter. That day I did find out that I was literarily on the opposite end of the country from all of the closest friends I had made, standing at my end of the map and looking up at the others so far away was jarring. This month was also a month to prepare to say goodbye to our Homestay families. The people who had taken such good care of us for the last 3 months. Feed us, cared of us when we were sick, showed us how to wash clothes, iron, clean etc. My mae Cecile, I think was very proud to have, “the chiquey African American Volunteer Diana, from Northern United States aka NY” LOL as the whole town of Namaacha knew me as. The pronunciation of Dione is a little complicated here, so I have adjusted to being called Diana or Manna D. Walking through the streets of Namaacha, it felt like I would hear everyone say my name, other volunteers would ask whether I knew people I was saying hi too, and I would have no clue. But it was because my mae was talking about me. And we had to leave this place that literally was like a little bubble of protection. To end our time here we had celebration with our families. The maes cooked an amazing dinner. I and a few other Volunteers had been practicing a traditional dance of the province of Nampula, and we performed for the families. Then our maes received certificates. It was a beautiful day ironically that night a storm came in that turned Namaacha upside down, destroyed homes and messed up power and internet service in our town for a few days. Guess that was our goodbye present. 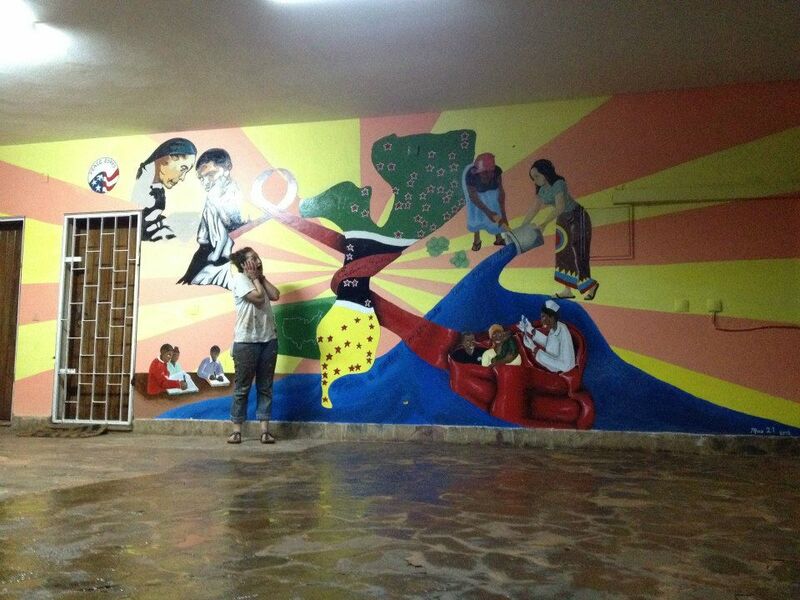 Our mark on Namaacha is no doubt the mural that we painted on the wall of the Peace Corp office there. Together we worked for three days to make this beauty happen. I am pretty impressed by how it turned out. Big shout out to the mastermind Tania! This month was also our final LPI test. This is the test that determines our language level as we start our service. 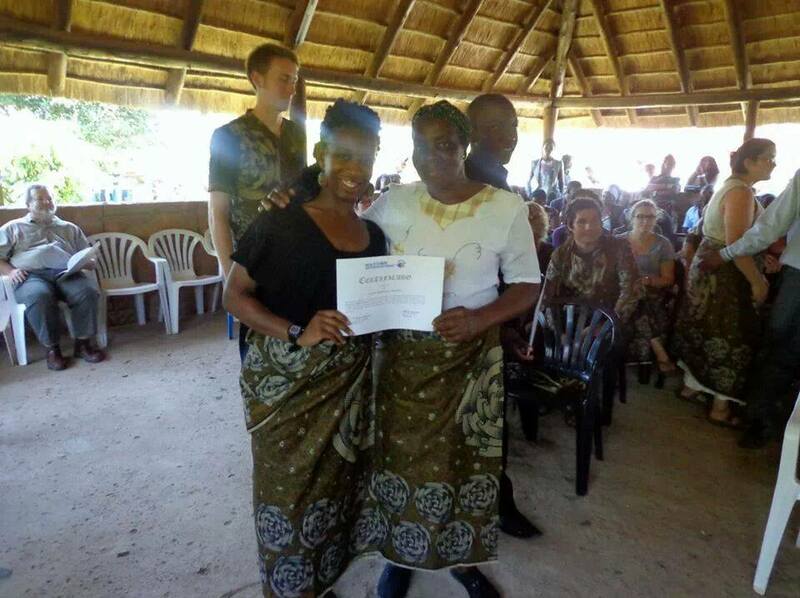 This was a stressful day, as I have said before language is not my strong suit, and I came into Mozambique with 0 Portuguese language training, and 10 years without any formal language training period. Some of the Volunteers coming in had a Spanish background, which has helped them translate words. So after 3 months of practicing and language classes, my language proficiency is at an Intermediate Low. Ehhh.. I was a little disappointing. Granted I started at a Novice Low, but I was aiming for an Intermediate Mid. Actually I think I could have hit the Intermediate Mid, but I was so nervous and had so much on my mind that weekend, missing stuff back home and the holidays. Literally when I was asked questions during the language test, I couldn’t even think of the answers in English much less in Portuguese or the answers I began thinking of in English were so complicated that I didn’t have the Portuguese vocabulary to say them. Anyway, one of my main goals here is definitely becoming someone fluent in the language, and I am (ehh somewhat) happy in the progress that I have made. But a lot of what I do here is study. Those were our last few days in Namaacaha, filled with ups and downs of emotion. A few days after all of that we departed to our sites, first to Maputo the capital city to have conferences and our swearing in ceremony. We went to the US ambassadors house, sang the Hino National of both Mozambique and the US, and swore an oath that all US Government official swear…Pretty official stuff! And then off to our sites. As I write this letter I am currently in my permanent site. The town of Manhica, in an Instituto de Formacao de Professores or IFP, called Chibututuine. This is a teacher training school. A gorgeous campus, in a friendly town, about an hour away from the capital city of Maputo. I will be teaching English and Methodology to students between the ages of 17 and 25. My home is on the campus, sort of a row apartment next to other teachers and the director pedagogical of the school. My roommate is Shay, she is a volunteer who has extended another year to stay at this school. We got along during my site visit and I am pretty sure we will get along ok during my time here. . The volunteer I am replacing has been here for 3 years, she also extended for another year. She was extremely well integrated. And I believe the community thrived with her here. My concern of course is language. Because I am an English Teacher, I will have to talk to the students in English, and of course all of the professors want to learn English too. But I am going to make an agreement with a professor here, they tutor me in Portuguese and I will give English lessons. If anyone has ESL stuff, please feel free to send!! I will also have free internet pretty regularly so please send Skype info so I can Skype into some people. I can’t wait to see how much further we can grow this community. My first goal is getting the school a working, clean library. There is one in place but, I especially want to bring in some different views of American Culture….Essence or Ebony Magazines please…. If you have them please send them. Oh cultural discussions……there is a lot to say about Mozambicans view on American Culture and even Americans view on American culture. I don’t think I have ever talked about race as much as I am talking about it here. Surprisingly not as much to the Mozambicans as I am to the Americans. Mainly in conversations about when Mozambicans see groups of Americans, and my American counterparts will comment about the Mozambican reaction to seeing “white people.” Last time I checked I wasn’t white, and I am still American. It is almost as if being Black American is ignored…I have vocalized that I would prefer if we refer to our group as American and not white. So I’ve had quite a few conversations with some of my colleagues here. ON the Mozambican end, it is more of a conversation about whether I am Mozambican, and disbelief that I don’t speak Portuguese. ..lol. “Yes, I am American. Yes, I was born in America. Yes, I speak English. Yes, my skin is the same color as yours. Yes, there are black people in America as well. No, we do not consider ourselves white.” I actually got my skin rubbed, to see if the color would come off. LOL. 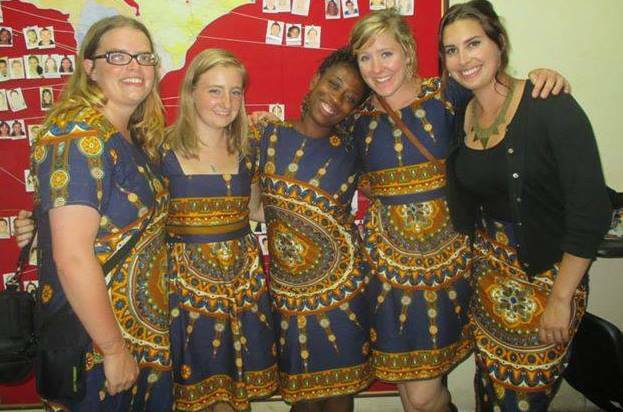 One of the goals of Peace Corps is cultural exchange. I am very happy that I am able to bring a different perspective of American culture to Mozambique and in many cases to Americans. I am appreciating the diversity that I grew up with realizing that not only are people in Mozambique not accustom to such diversity but some people in US haven’t been exposed to that diversity either. Oh the learning experiences!!!! I am still loving it here! I am still so happy, so excited, and feeling so blessed. I got my hair done, twisted again. I was pretty happy with it, I don’t know how I am going to do the natural hair here. It is quite difficult to do anything involving my hair while taking a bucket bath! Thank you for the support, love and packages sent. If you are interested in sending anything.. stickers for students are something I can’t seem to find that easily here.